A seemingly unexpected patch has made its way to Call of Duty: Ghosts. The newest update adds some unique e-sports features and tones down the minimum computing requirements to enjoy multiplayer matches. The new base RAM requirement for Ghosts' multiplayer mode has been set at 4GB, down from the original 6GB. Infinity Ward will be releasing its official patch notes later today, but as of now we aren't exactly sure where the "downgrade" is coming from. Regardless of the reasoning this is definitely welcome news to gamers who wish to get in on the action but don't have access to a powerful PC. 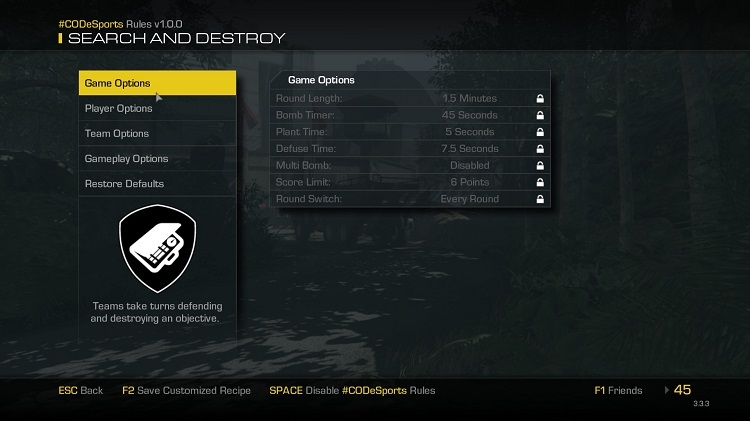 Dedicated CoD gamers also pointed out some new e-sport features. These were expected to drop sometime during the next MLG Championship, but have made a surprising early appearance as part of the new update. Search & Destroy and Blitz seem to be the only two game types affected by the upgrade at this time. You will now find some hard-coded rule sets for these modes, allowing you to set weapon, perk, and equipment restrictions in private matches. In addition to these rule sets, you'll also get a "Broadcaster" mode, which offers some unique camera views and video recording options. Currently, the mode allows for first-person, third-person, and over-the-shoulder views. The 400MB+ patch is now available for download on Steam.